Definition at line 333 of file deflate.h. Definition at line 326 of file deflate.h. Definition at line 42 of file deflate.h. Definition at line 51 of file deflate.h. Definition at line 80 of file deflate.h. Definition at line 60 of file deflate.h. Definition at line 308 of file deflate.h. Definition at line 39 of file deflate.h. Definition at line 81 of file deflate.h. Definition at line 58 of file deflate.h. Definition at line 79 of file deflate.h. 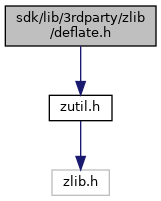 Definition at line 23 of file deflate.h. Definition at line 56 of file deflate.h. Definition at line 54 of file deflate.h. Definition at line 36 of file deflate.h. Definition at line 82 of file deflate.h. Definition at line 30 of file deflate.h. Definition at line 33 of file deflate.h. Definition at line 48 of file deflate.h. Definition at line 289 of file deflate.h. Definition at line 182 of file deflate.h. Definition at line 284 of file deflate.h. Definition at line 59 of file deflate.h. Definition at line 281 of file deflate.h. Definition at line 294 of file deflate.h. Definition at line 94 of file deflate.h. Definition at line 92 of file deflate.h. Definition at line 93 of file deflate.h. Definition at line 84 of file deflate.h. Definition at line 98 of file trees.c. Definition at line 104 of file trees.c. Referenced by _tr_tally(), compress_block(), and tr_static_init().